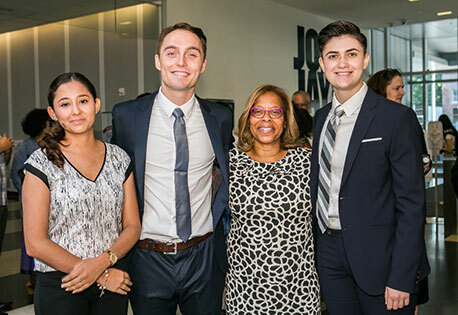 The Office of the President at John Jay College of Criminal Justice is seeking qualified undergraduate and graduate students for the annual Presidential Internship program. Through this program current John Jay students will be exposed to the inner workings of an executive office in a major educational institution and assist the Offices of the President and Public Affairs in a broad range of capacities. Presidential Interns report to the staff of the Office of the President and the Vice President of Public Affairs and Strategic Initiatives. The Office of the President is a dynamic workplace that must be responsive to many types of requests and issues. Therefore, successful candidates will demonstrate the competencies outlined below. This internship is a part-time paid position. Interns will be required to work 20 hours per week and must adhere to the office confidentiality policy. Completed applications must be received by 5pm on May 11, 2018. Finalists will receive an invitation to an interview in May and should expect a 45-minute in-person activity designed to assess applicants’ relevant skills. Candidates should expect to be notified of selection by June. Selected applicants are expected to start their internship August 1, 2018. The Office of the President is committed to fostering a diverse and inclusive workplace environment. Students from all academic backgrounds are encouraged to apply. Students are required to submit a GPA with their application, and are also invited to provide a brief explanation of any information relevant to their GPA.